Exciting Right Whale Sponsorship News! For more than 20 years, over 2,300 people have supported our research by participating in the Right Whale Sponsorship Program. As sponsors, they have learned about the plight of this endangered species and our 35 years of research to protect them. The Right Whale Sponsorship Program provides vital support for our work and we are so grateful to all who have taken part in the Program over the years. We have some EXCITING Sponsorship news to share and we hope that in this upcoming holiday season you will consider sponsoring a right whale and/or purchasing one of our great right whale-themed gifts! UPDATED SPONSORSHIP MATERIALS! All of our sponsorship packages have been updated with a fresh new look and materials! 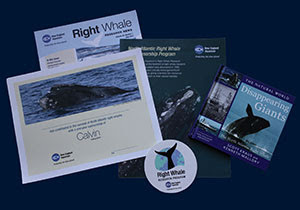 Full color informational booklets, the hardcover book “Disappearing Giants”, a one-year subscription to our biannual newsletter, Right Whale Research News, stickers, and a coupon to the New England Aquarium Gift shop are included in all sponsorships. And don’t forget: Each sponsorship is tax deductible and directly supports our Right Whale Research Program! NEW WHALES! There are three new whales available to sponsor: Aphrodite, Manta and Gemini! Each whale has a fascinating history and we are eager to share their stories with you! Meet all the Sponsorship whales here. CALLING ALL TEACHERS! We now offer a Classroom Sponsorship that's perfect for classroom or service projects. Along with all the other sponsorship materials, the Classroom Sponsorship also includes a single plush right whale for the classroom, stickers for up to 30 students and access to the right whale-themed Smithsonian in your Classroom lesson plans "The Tale of the Whale"
Learn more about our Sponsorship program and the different support levels available here. RIGHT WHALE THEMED GIFT IDEAS! 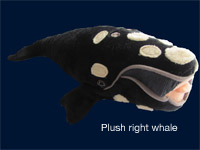 In addition to sponsoring a right whale, you can shop in support of Right Whale Research by purchasing T-shirts, books or the super soft right whale plushy. Net proceeds go directly toward the annual costs of field research, data analysis and professional collaborations. These all make wonderful gifts for any occasion and shipping is FREE! Thanks again to our sponsors for all your support over the years!! 36 field seasons in BOF completed! "But... how do we get to shore?" #24: Last days on Roseway Basin and an exciting surprise! After a terrific day with right whales on September 13, we retreated to the wharf at Sable Fish Packers on Cape Sable Island, NS, to nestle among the fishing boats and wait out another couple of days of bad weather. 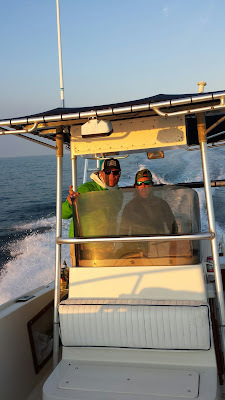 By Monday, the weather had moved through, finally clearing on land, however the fog lingered offshore. On Tuesday morning, September 16th, we headed out at first light, full of anticipation of more right whales. But they had vanished from where we had seen them the week before; it has been like surveying for melting ice cubes this year! Nonetheless, we forged ever hopeful surveying the Roseway Basin critical habitat traveling on north-south tracklines from east to west. We spotted right whale flukes in the waning minutes of daylight, and stopped there for the night on the western corner of the critical habitat. Our sleep was interrupted when the currents took us east to within 2 nm of one fishing boat and with others close by. The Captain was raised by the team on watch to steer us to the west away from other boats. Sunrise on Wednesday was clear and calm and gave us hope for one last good day. Only 10 nm south of the end of our last trackline, we decided to add some additional east to west lines in case the right whale in the distance the afternoon before was still in the area. We surveyed to the east and ran into patches of fog (again); traveled north a couple of miles and then back to the west, the fog bank persisting to the south. Upon reaching our starting point for the day, we turned north with a plan to survey all the way to Yarmouth, Nova Scotia, where we would spend the night. The team’s mood was quiet—we had been hopeful of more right whale sightings on this last day. Conditions had become so calm it was hard to detect whale blows. The team on watch radioed down to the Captain to slow the boat—flukes had been seen. Meanwhile a team member on the deck getting ready to replace the team on watch called to the captain – there’s a right whale right beside the boat! Sure enough, a small animal was just rolling around at the surface. We swung the boat around, and starting shooting photographs and video footage. Before long a much larger whale surfaced and the broad white scar on her right flank sealed the id: it was Calvin (Catalog #2223)! The smaller whale was her calf! It was September 17th, 23 years and 12 days after Calvin’s mother Delilah had been killed by a ship in the Bay of Fundy. 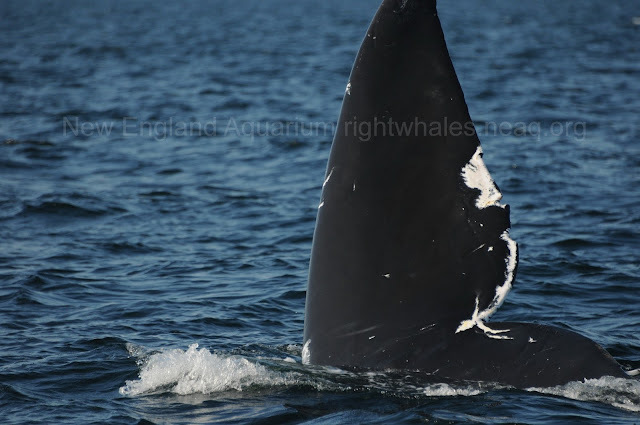 Calvin was less than a year old at the time and survived early weaning and then later two entanglements in 1994 and 2000; the latter one serious enough to require intervention by whale rescue teams. This sighting in 2015 was with her third calf and was remarkable in many ways. Mother calf pairs are quite unusual on Roseway Basin; only seven have been recorded since 1985 prior to Calvin and her calf this year. It was the second sighting of Calvin and her calf this summer. The previous one occurred on August 20 near Pomquet Beach near Antigonish, NS, in the southern Gulf of St. Lawrence, when they were photographed by biologists studying piping plovers. Calvin has become an icon for the struggles of the North Atlantic right whale from the impacts of vessel strike and gear entanglement and is yet again an icon for a trend of changes in patterns of habitat use over the last four years. The New England Aquarium team and the public values her so much, we made Calvin one of the whales available to sponsor through our sponsorship program! Following our return from the survey, I traveled to Saint John, NB, and stood below the skeleton of Delilah to speak to a reporter about our sighting of Calvin, quite an emotional location to tell a story we never dreamed of in 1992—that the little calf would survive and go on to be now a three-time mother. We had one more right whale sighting at the end of this day, bringing the total of right whales seen on our second Roseway trip to 17! Our surveys are over for this year, and the winter will be spent pouring over the photos and data, and planning for 2016. The research team on the Shelagh would like to extend our gratitude to our Captain Joe Howlett for making all of our trips safe, fun and successful! Early on September 22 as we were surveying the Bay of Fundy, we spotted the flukes of a large, diving whale and soon realized there was more than one whale in the area. We found two humpbacks and photographed them. As we were working them, we spotted a right whale close by, identified as Glacier (Catalog #1402). Glacier is a 31-year old male last sighted in 2013 off the Northern Florida coast. He is named for a large white scar on his back that looks like melting glacier. When we first found him, he was fluking in a unique way that resembled tail slashing, and he also lobtailed briefly. We followed Glacier and soon found a second right whale, Comet (#1514). The two surfaced near each other at one point, but did not seem to be associated. Comet is at least 30 years old and was last seen in 2014. He also has a distinctive scar on his back, from which he derives his name. By the end of the day these were the only right whales we found, but we did see a total of 202 harbor porpoise, as well as a few other humpback and minke whales. The wind unexpectedly died down on the morning of September 25, so we decided to head out for our last afternoon on the Bay of Fundy. A team of six went out on the Nereid to survey North and East, and a team of two joined Chris on his boat, Jupiter, to survey South and West. On the Nereid, we saw very few animals during our first few hours on the water. Then, Kelsey saw some whitewater in a seaweed patch, which typically indicates of the presence of an animal. We slowed down to identify the creature, and it turned out to be a right whale! It was behaving strangely, waving the tip of its fluke back and forth just above the water, then sinking for long periods of time without fluking. We had a difficult time getting ID-able photographs during this encounter and ended up staying with the whale for about an hour, without much success. We also saw a second right whale fluke a bit further away and photographed it from a distance, but were unable to relocate it. Even though these two sightings were frustrating and hard to work, we were excited that there were whales in the Bay! After leaving the whales, we continued our survey but did not see much more than harbor porpoise, puffins, and a basking shark breaching in the distance. The Jupiter surveyed some new areas for the season and made a pit stop to check out the historic lighthouse on Gannet Rock (built in 1831!). Though they didn't have any luck in finding right whales, they did get some close looks at a pair of humpbacks, one of which lobtailed several times! While crossing the Grand Manan Channel, we all were treated to arguably the most spectacular sunset of the season. The wind looks like it will be blowing hard for the rest of the week, so sadly, the 25th really was our last day out on the water. The Nereid will be hauled out of the water and the field station will be packed up this week. The whales were few and far between this season, but we did our best to find the ones that did venture into the Bay of Fundy. This is Part Four of a series of posts about surveys taking place in the Baie de Chaleur in the southern Gulf of St. Lawrence. Click on the links to read Part One, Part Two, and Part Three! While hauling the R/V Callisto, Alex noticed an adult northern gannet with limited movement at the boat ramp. Upon approach he saw that there was a hook stuck in its wing with line originating from its mouth; the line wrapped the wing in such a way that it could not extend it and who knows how long it had been entangled like this. We knew that we had to do something to help this individual. We promptly devised a plan to safely secure the bird and gathered the appropriate tools (gloves, wire cutters, towel and sunglasses as safety goggles) to remove the hook and monofilament line. Alex blocked its access to the harbor and distracted it so Monica and I could carefully capture it. We successfully cut the hook and removed as much line as we could, and were happy to see the gannet flee to the water with its wings lifted. On Tuesday, August 25th, we had a great forecast so decided to travel to the northern opening of the Bay of Chaleur in an attempt to make it as close to the Gaspé Peninsula as time and weather would allow. We encountered some fin and minke whales, but other than that the survey was relatively quiet. We reached Percé in the afternoon and stopped for a quick lunch break and to take in the beautiful views. Here we got to watch northern gannets on Bonaventure Island, the largest colony in North America. Males are competitive for prime nesting sites and are the principal nest builders using mud, grass, seaweed, and feathers. Northern gannets are monogamous and long term pairs often use the same nest for years and potentially mate for life. Both parents incubate the single egg and are active in feeding the chick. It was amazing to see the white bodies crowding the cliffside and the active scene on the island and in the air. As we watched the gannets on and around Bonaventure we pondered (and hoped) that the one we had helped earlier in the trip was there and reunited with its mate. After this refreshing break we continued our tracklines back towards our dock and scanned the water for what we had come to find- a right whale. #17 Bay of Warmth (Part 2): Lets Get on the Water! 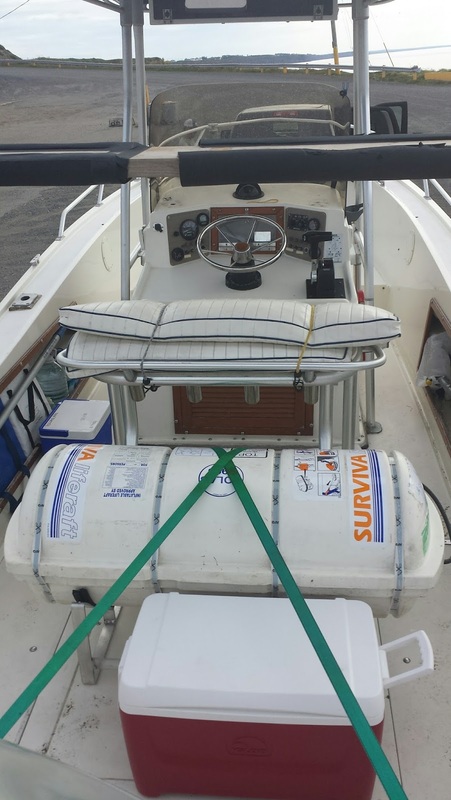 This is Part Two of a series of posts about surveys taking place in the Baie de Chaleur in the southern Gulf of St. Lawrence. Read Part One here. Once we arrived in our temporary home of Janeville, New Brunswick we quickly went to work getting things ready for survey. We unpacked, set up equipment, launched the boat, checked the weather and met about various trackline strategies. Even though we were in an area completely new to us we had some advantages. The biggest advantage was that we had colleagues in the general vicinity conducting aerial surveys for right whales. We hit the ground running with one day on land followed immediately by three long boats in a row. With such a small team we had no breaks while on the water. We rotated from two hours of observation to one hour at the helm and back to two hours of observing. In addition, we had no dedicated data recorder which meant driving and recording was done by the same person. This was challenging in rougher sea states. Our first three days on the water were productive. We didn't see any right whales but we felt good about our efforts. Logistically speaking things were going great. We logged many miles of trackline data right from the start. We were quickly learning about the local wharfs, boat ramps and weather patterns of the area. We felt confident and well seasoned, now we just needed to find some right whales. Each morning brought new anticipation, excitement and a bit of nervousness. With only eight boat days of survey budgeted each day without whales brought a new sense of urgency to our time. Keep reading! Click here to read Part Three!.